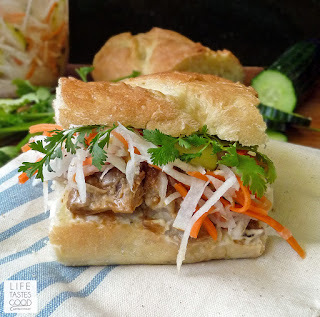 Pulled Pork Banh Mi is a unique and delicious way to re-purpose leftover pulled pork. A fusion of French and Vietnamese cuisine, the Banh Mi sandwich is a flavor powerhouse that gives all five senses a workout! 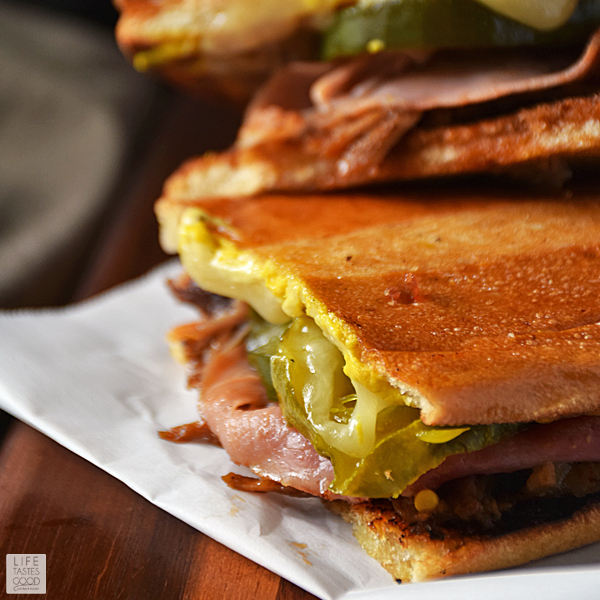 The flavor combination in the Banh Mi Sandwich is one of my favorites! 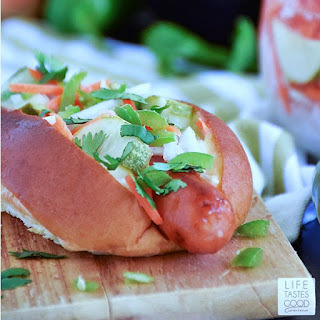 I love to experiment with these flavors and create new recipes such as my Banh Mi Hot Dogs. Recently, I found myself with a ton of leftover Beer Braised Pulled Pork. I wanted to use the pork to create new dinners for us to enjoy without feeling like we were eating the same thing over and over again the whole week! Don suggested using it to make a Banh Mi wrap "just like the hot dogs", he said. I decided this was one of his genius moments! He has those every so often <smile>. 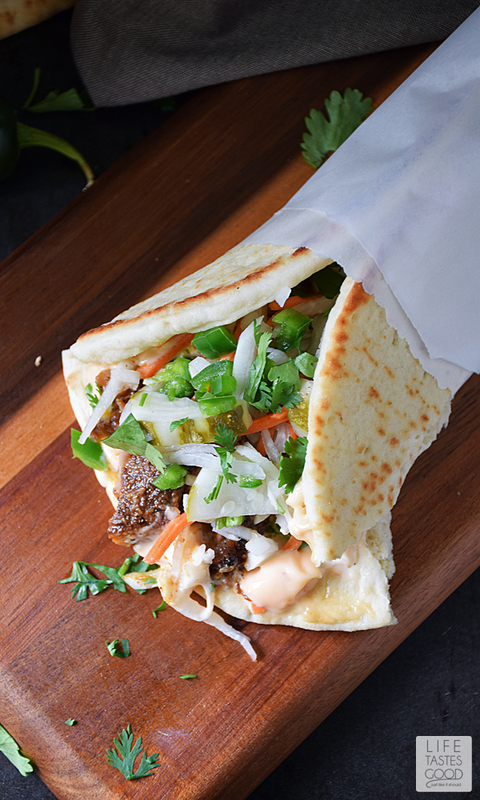 This Asian inspired recipe starts with flatbread slathered in a garlic chili mayo that wraps around tender, juicy Beer Braised Pulled Pork topped with tangy Pickled Vegetable Slaw, finely diced jalapeno peppers, and finished with fresh cilantro. Oh my yumminess! It is so good, y'all! The barbecue pork flavor blended nicely with the traditional Banh Mi flavors and even added a little more zing! 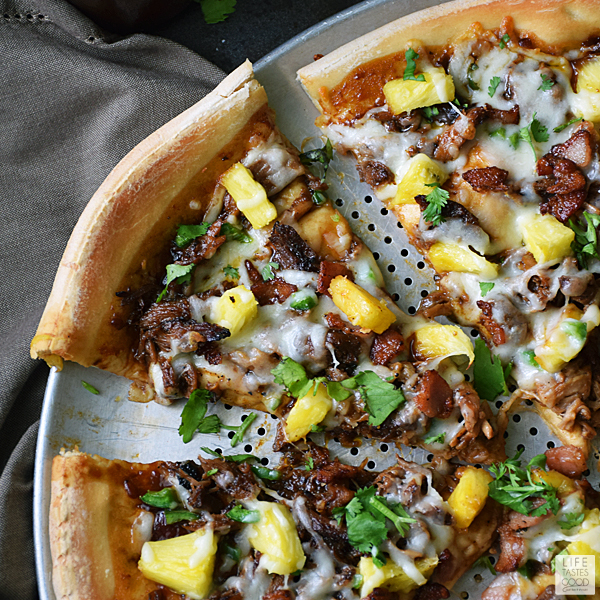 and Pulled Pork Pizza (recipe coming soon). 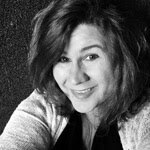 Click here to join my mailing list so you don't miss it! Mix 1/2 cup mayonnaise with 1 teaspoon freshly minced garlic and 1 teaspoon sweet and sour sauce until combined. Give it a taste and add a pinch of salt as needed. Adjust the flavors to your liking by adding more sweet and sour sauce or garlic. Heat the flatbread slightly.I wrap it in a moistened paper towel and heat it in the microwave for about 15 seconds or so. This helps it to be a little more foldable. Spread the garlic chili mayo over each flatbread. I'm pretty generous with this delicious mayo, but use it as much or as little as you like. You can always add more if needed. Top each flatbread with about 1/4 cup of warmed Beer Braised Pulled Pork. 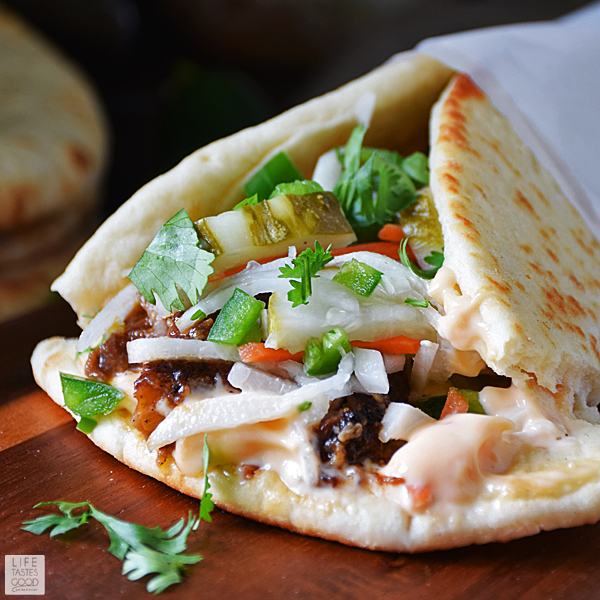 On each flatbread, top the pulled pork with about 1/4 cup of pickled vegetable slaw and sprinkle with 1/2 tablespoon of freshly diced jalapenos and 1/2 tablespoon of freshly chopped cilantro. Fold and enjoy! Hi, I made these tonight after searching for recipes to use leftover pulled pork in. My husband said that this was one of the best dinner's he has ever had. Thanks!